The project Work Plan has been organised through six Work Packages, on a 24 months period. WP1 User requirements and technology (led by TERABEE), whose objective is the understanding of user requirements and technology constraints. It includes a survey of the state-of-the-art technologies (satellites and RPAS) dedicated to Railway Asset monitoring and the analysis of the specific end user requirements for the monitoring of key assets. The analysis of current regulatory barriers, in particular relevant to RPAS usage, will be also performed. WP2 Multiscale-Monitoring methodology & tools (led by e-GEOS), whose objective is the elicitation of monitoring requirements, first of all by elaborating a table relating asset parameters of interest and technologies apt to detect them; in the case of RPAS monitoring, the system embarking suitable sensors will be designed and prototyped; technical specification and monitoring methodology will be defined for large scale and small scale monitoring. WP3 Automated Data Processing & Post Processing (led by CTTC), whose objective, by elaborating the requirements identified in WP1 and the technical specification from WP2, is to select optimal Data processing and post-processing methods, as well as data fusion approaches, deriving algorithms and automated SW chain prototypes. A platform prototype, with a suite of tools providing functionalities, including visualisation, analytics and information extraction capabilities, interfaces to access data, will also be developed. The integration and testing procedure will take into account the feedback from the demonstration cases. 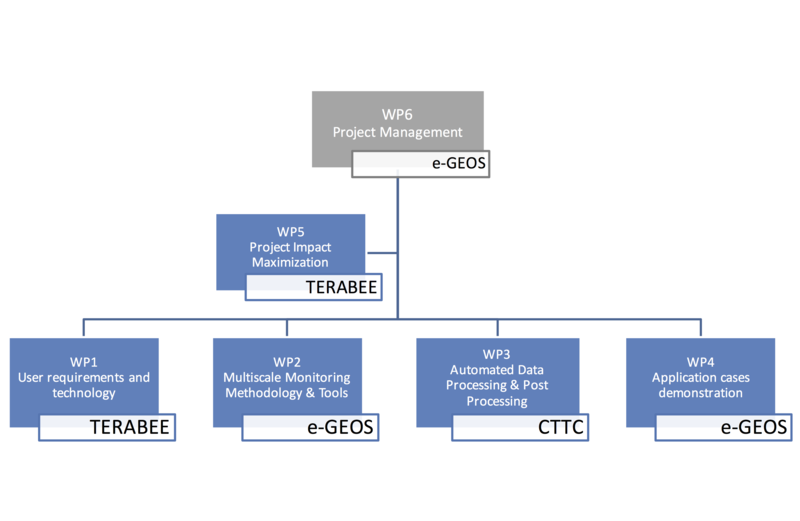 WP4 Application cases demonstration (led by e-GEOS), with the objective to run the six demonstration experiments; the pilots will measure, through KPIs and Success Criteria defined in the set-up of the test cases scenario, the advantage (in terms of new products, cost benefits and information value) of the chosen monitoring approaches for the specific test case. The pilots will cover specific asset management issues, i.e. ground movements nearby the infrastructure, Hydraulic activities nearby the track, Global supervision for natural hazards, Electrical system monitoring, Civil engineering structures monitoring, Safety monitoring. During the test case execution, the effectiveness of the monitoring solution and the platform prototype will be assessed and modifications implemented if necessary. WP5 Project impact maximization (led by TERABEE), with the objective of assessing the economic sustainability of the proposed solutions and sketching a road map to go from demonstrators to market-ready solutions. To raise awareness of MOMIT and its objectives, activities and results, an effective stakeholder involvement strategy and dissemination & communication plan is put in place. This activity is continuous throughout the project and will be reinforced when demonstration outcomes are ready to be promoted. WP6 Project Management (led by e-GEOS), with the overall management of the project according to the Contract, EC directives and Consortium decisions. The WP activities include the consortium management and the coordination of the Consortium Board, the interface towards EC, the monitoring and control of the project progress, the administrative and financial management, the technical management of the overall project, the management and the conduction of the Steering Committee and the complementary activities w.r.t. the IN2Smart project. Key activities included are also the Innovation management and the Risk management.